Rodgers played alongside the great Wilt Chamberlain from 1959 through 1964, and during Chamberlain's famous 100-point game, he led the way with 20 assists. In the 1962–63 season, Rodgers led the NBA in assists with an average of 10.4 per game, and played in his first NBA All-Star game. On March 14 of that same season, Rodgers tied Bob Cousy's record of 28 assists in a single game — a record that wasn't broken until nearly 15 years later. Rodgers was the point guard on the 1964 Warriors team that made the NBA finals but eventually lost the series to the Boston Celtics four games to one. In 1966 Rodgers was traded to the expansion team, the Chicago Bulls. Rodgers played the 1966–67 season in Chicago and was named NBA All-Star for the fourth and final time in his career. That same season, Rodgers handed out a then-NBA record 908 assists, which is still the Chicago Bulls single-season record. 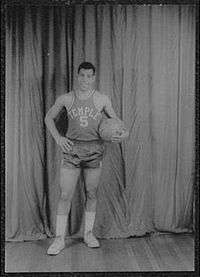 With four games played in the 1967–68 season, Rodgers was traded to the Cincinnati Royals. After finishing the season in Cincinnati, Rodgers moved to Milwaukee and joined the Bucks for his two final seasons. On February 14, 2014, Rodgers was announced as a 2014 inductee to the Naismith Memorial Basketball Hall of Fame; he formally entered the Hall on August 8, 2014. ↑ "Guy Rodgers". Retrieved 2007-12-25. ↑ Heffernan, Jim (1962-03-14). "Chamberlain makes the 'impossible' possible – 100 points". The Sporting News. ↑ "NBA Regular Season Records: Most Assists – Single Game". Retrieved 2007-12-25. ↑ "Five Direct-Elect Members Announced for the Class of 2014 by the Naismith Memorial Basketball Hall of Fame" (Press release). Naismith Memorial Basketball Hall of Fame. February 14, 2014. Retrieved February 15, 2014.